The Solemnity of the Epiphany is celebrated either on January 6 or, according to the decision of the episcopal conference, on the Sunday between January 2 and January 8. The young Messiah is revealed as the light of the nations. Yet, as the antiphon for the Magnificat at Second Vespers reminds us, three mysteries are encompassed in this solemnity: the adoration of the Christ Child by the Magi, the Baptism of Christ and the wedding feast at Cana. Extra candles and/or lamps may be placed around the sanctuary and in other parts of the church to honor Christ revealed as the Light of the Gentiles (Ceremonial of Bishops). 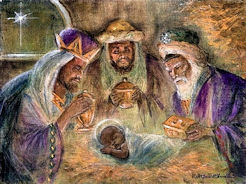 It is customary to replace the images of the shepherds at the crib with the three Magi and their gifts. — Ceremonies of the Liturgical Year, Msgr. Peter J. Elliott, Ignatius Press. The feast of the Epiphany, which was kept in the East and in certain Western Churches before being observed in Rome, seems to have been originally a feast of the nativity; January 6, for those churches where it was kept, was the equivalent of Christmas (December 25) in the Roman Church. The feast was introduced at Rome in the second half of the sixth century and became the complement and, so to say, the crown of the Christmas festival. Epiphany means manifestation. What the Church celebrates today is the manifestation of our Lord to the whole world; after being made known to the shepherds of Bethlehem He is revealed to the Magi who have come from the East to adore Him. 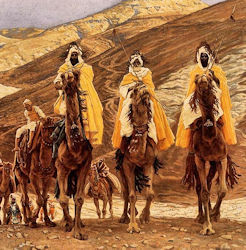 Christian tradition has ever seen in the Magi the first fruits of the Gentiles; they lead in their wake all the peoples of the earth, and thus the Epiphany is an affirmation of universal salvation. St. Leo brings out this point admirably in a sermon, read at Matins, in which he shows in the adoration of the Magi the beginnings of Christian faith, the time when the great mass of the heathen sets off to follow the star which summons it to seek its Saviour. That is the meaning, too, of the wonderful prophecy from Isaias which the liturgy appoints to be read in the first nocturn at Matins and at the Epistle of the Mass. This same thought of universal redemption the Church returns to as she sings, in the antiphon to the Magnificat at 2nd Vespers, applying the words to herself, of the union with Christ typified by the wedding feast at Cana, by the baptism of her children foreshadowed by that of Christ in the waters of the Jordan. 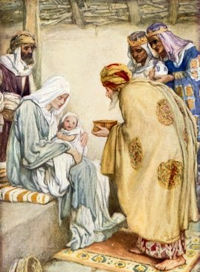 Formerly the Epiphany was an additional day for solemn baptisms. The feast of Raymond of Penafort, which is ordinarily celebrated today, is superseded by the Sunday liturgy. the assignation of Patrons; in many religious communities and confraternities, patron saints are assigned to the members for the coming year. The Epiphany is indeed a great Feast, and the joy caused us by the Birth of our Jesus must be renewed on it, for as though it were a second Christmas Day, it shows us our Incarnate God in a new light. It leaves us all the sweetness of the dear Babe of Bethlehem, who hath appeared to us already in love; but to this it adds its own grand manifestation of the divinity of our Jesus. At Christmas it was a few Shepherds that were invited by the Angels to go and recognize THE WORD MADE FLESH; but now, at the Epiphany, the voice of God himself calls the whole world to adore this Jesus, and hear him. The mystery of the Epiphany brings upon us three magnificent rays of the Sun of Justice, our Savior. In the calendar of pagan Rome, this Sixth day of January was devoted to the celebration of a triple triumph of Augustus, the founder of the Roman Empire: but when Jesus, our Prince of peace, whose empire knows no limits, had secured victory to his Church by the blood of the Martyrs, then did this his Church decree that a triple triumph of the Immortal King should be substituted, in the Christian Calendar, for those other three triumphs which had been won by the adopted son of Caesar. The Sixth of January, therefore, restored the celebration of our Lord&apos;s Birth to the Twenty-Fifth of December; but in return, there were united in the one same Epiphany three manifestations of Jesus&apos; glory: the mystery of the Magi coming from the East, under the guidance of a star, and adoring the Infant of Bethlehem as the divine King; the mystery of the Baptism of Christ, who, whilst standing in the waters of the Jordan, was proclaimed by the Eternal Father as Son of God; and thirdly, the mystery of the divine power of this same Jesus, when he changed the water into wine at the marriage feast of Cana. Excerpted from The Liturgical Year by Abbot Gueranger O.S.B. Thy conquests, O King of ages! begin with thine Epiphany. Thou callest, from the extreme parts of the unbelieving East, the first-fruits of that Gentile world, which hitherto had not been thy people, and which is now to form thine inheritance. Henceforth there is to be no distinction of Jew and Greek, of Barbarian and Scythian. Thou hast loved Man above Angel, for thou hast redeemed the one, whilst thou hast left the other in his fall. If thy predilection, for a long period of ages, was for the race of Abraham, henceforth thy preference is to be given to the Gentiles. Israel was but a single people; we are numerous as the sands of the sea, and the stars of the firmament. Israel was under the law of fear; thou hast reserved the law of love for us. From this day of thy Manifestation, O divine King! begins thy separation from the Synagogue, which refuses thy love; and on this same Day, thou takest, in the person of the Magi, the Gentiles as thy Spouse. Thy union with her will soon be proclaimed from the Cross, when, turning thy face from the ungrateful Jerusalem, thou wilt stretch forth thy hands towards the nations of the Gentiles. O ineffable joy of thy Birth! but O still better joy of thine Epiphany, wherein we, the once disinherited, are permitted to approach to thee, offer thee our gifts, and see thee graciously accept them, O merciful Emmanuel! 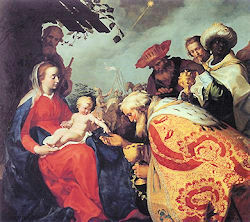 Read about the Epiphany, or the Manifestation of the Lord. For family activities please see the Blessing of Water and Chalk and the Blessing of the Home on Epiphany.